Riding fans and incurable romantics will be glad to hear that this relatively new addition to the list of alternative forms of island touring is already a success. 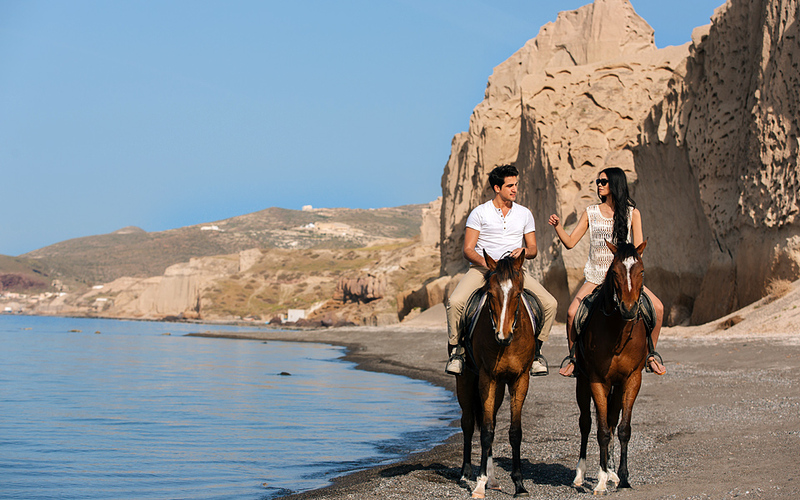 Once a key mode of transport on this craggy island – and an environmentally-friendly one at that – horses are perfect traveling companions, as the staff of family-owned Santorini Horse Riding know very well. This is why they decided to design a series of excursions that offer visitors not just fresh insights into the island, but also into these noble animals. Manos, Taxiarchis, Noni and Argyro are just four of the 15 horses that can take you from Megalochori, the village where the stables are located, through uncharted trails, past vineyards, down impressive gorges and along romantic beaches, with possible stops at traditional tavernas and wineries. The team offers three excursions: the Megalochori Tour (1 hour; €45 per person or €90 with a meal and wine tasting); the Vlychada Beach Tour (2 hours; €90 per person or €150 with a meal and wine tasting); and the Caldera Tour (2 hours; €90 per person). The price includes all equipment, bottled water and photographs from some of the prettiest spots along the way. There is a small additional fee if you wanted to be picked up and dropped off at your hotel. Groups are kept small, at four to five people, in order to ensure the best possible experience for everyone, while you can also arrange a private excursion (ideal for couples). Inexperienced riders will be shown the dos and don’ts, while all guests are given a few moments to acquaint themselves with their horses before they set off. Children must be chaperoned by a parent or guardian. Will Santorini’s Volcano Erupt Again?